This documentary is a stunning piece of work, in part because it takes the subject completely seriously. This is about trying to understand where Camping was coming from (specifically what his basis was for those hyper-specific predictions) and examining the history of similar apocalyptic predictions. What is it about humans that makes us believe that apocalypse is always right around the corner? As the film discusses through interviews with Biblical scholars, we are as convinced today that the end is nigh as we were two thousand years ago. It is curious, and fascinating, that pretty much every human generation is convinced that, as Camping insisted, "It is going to happen!" And when it doesn't, subsequent generations find new reasons to believe the same thing. When the apocalypse failed to occur, this of course left Piestrup with a wealth of material for a feature documentary. (He also interviewed Biblical scholars later, who are the intellectual pillars of the film.) Piestrup interviewed Camping one last time, a year after his failed prediction. That interview is the emotional heart of the film—it's where we learn what happens when an apocalypticist learns that he was wrong. That interview alone is worth the price of admission. I interviewed Piestrup via email over the last few weeks, talking about the film and its origins. Here's our conversation. Higgins: Tell me about the first time you met Harold Camping. Piestrup: It was at the end of his Thursday morning Bible Study taping. The show had wrapped. I remember immediately how kind, genuine, and patient he was with everyone (the Bible Study show had a studio audience). How big his smile was. I'm not sure Harold heard 80% of what was said to him. Harold's hearing was pretty bad at that point. But, he always tried. And so he was able to infer what was said by catching a few words and truly being there. 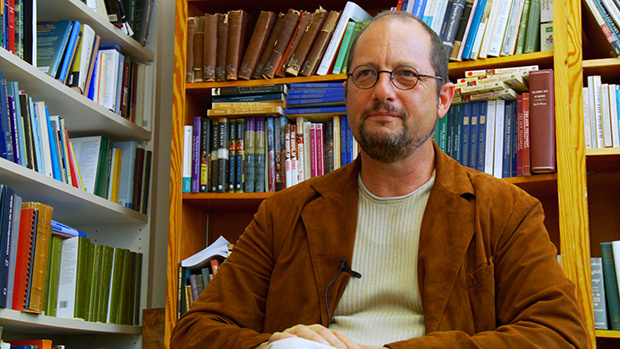 Prof. Bart D. Ehrman, UNC Department of Religious Studies. Photo by Zeke Piestrup. Higgins: About that Thursday morning Bible Study taping—give me more context on why you were there. I can see a bunch of potential reasons somebody might attend, from simple religious interest, to positive interest in Camping as a person, through to some kind of outsider perspective on trying to understand who this potentially-kooky Camping guy was. I know there is rarely a single reason anyone does anything, but in general, what brought you to show up at Camping's taping? Piestrup: I'm a nonbeliever, dude. But, down with Jesus. I'm also down with Jacques Tati, Lenny Bruce, and Harry Nilsson. In 2001 I was living in New York City. Planes flew into buildings a few miles down the street from my apartment. I did not know why. So, yeah, I started reading. And I have not stopped. First the newspaper, then I moved on to actual books. In 2002 my parents gifted me a Teaching Company DVD course. I chose Bart Ehrman's Introduction to the New Testament. I now have two bookshelves filled with stuff on early Christianity, the historical Jesus, apocalypticism, etc. The general thought of the crowd was whatever happened 2000+ years ago, we really could not know. Well, there's a lot that we can know. Basically, I got addicted to history—that's all this stuff is. Piestrup: I had always had an up-and-down relationship with Him. I grew up in Big Bear, a very religious town, so in my youth I went to church with friends or my Grandma from time-to-time. But then came love for the NFL, so I put Him on the back burner. In college, I developed a more combative view towards Christianity ("Why are they shoving this down my throat! Church and State, yo!" type of immature reactionism). A point that I differ greatly from my great Pop: He gets visibly angry when talking to folks with whom he disagrees. In general, mad dads ain't comfortable to be around. I think the world we live in is the result of the ingredients we threw into the oven. Here's the cake that came out. To be mad at the cake makes no sense. I am not an activist. I don't think big change is coming. And if you get angry, they win twice. From 2001-2010, the more I read, the less angry I became about Christianity. I've also done way too much yoga at this point. Role of the observer, know what I'm sayin'? So, I would smoke joints in the parking lot and go to church. Church is awesome. The parking is free, there's some great choirs, and the people are super nice to you. They're just so happy you're there. And in So-Cal, I was able to see Chuck Smith before he passed, I saw the Blind Boys of Alabama sing in the Crystal Cathedral (before it went bankrupt). But, I still haven't made it to TBN in Costa Mesa (although I have applied for numerous jobs there), or the First AME Church (a historic black church in LA). Smoking weed, going to church, readin' books, and headin' off to Mammoth when the storms hit. Skiing is my religion. The drive to Mammoth from LA is 5 hours. The first exit beyond the big bad city is appropriately called Dawn Road. And that's when the religious radio starts for me. If you're averse to this type of entertainment, best not to go to Mammoth with me. You're gonna get four hours of this stuff. When you hit the Ridgecrest area, that's when Family Radio comes in. And it was on one of these trips to Mammoth that I first heard Harold Camping. He had the most peaceful baritone. I get the same feelings listening to Harold that I do Vin Scully. It's comforting. I had been a fan of Harold's for years when I heard him say May 21, 2011 would be Judgment Day. I knew immediately that I had to be there. 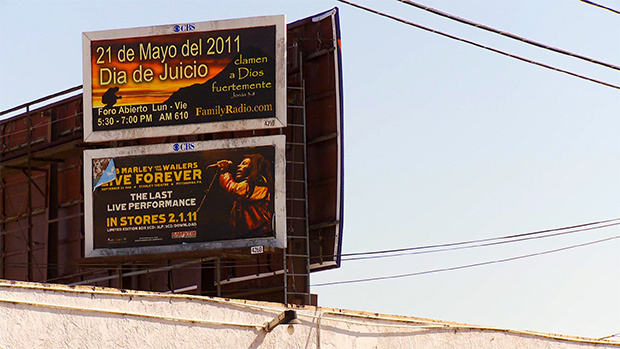 One of Family Radio's Judgment Day billboards in Oakland, CA. Photo by Zeke Piestrup. Higgins: So how did the YouTube videos start? Piestrup: I pitched Family Radio on doing daily videos counting down the last days on YouTube. I went up in mid-April  to demonstrate. They dug what I produced, and hired me in early May. 14 straight days of 19-hour days. It was madness. My girlfriend at the time, Bailey Damast, is an editor like me. We somehow managed to live through those hours and the non-Rapture, and remain a couple. The gig itself was AWESOME. Family Radio told me I would be there as long as Harold wanted me there. We hit it off. Every day he would show up for his Open Forum radio show a half hour early, and we would chat about whatever was on my mind. So even though we're producing these videos for YouTube, my mind is on the film. I'm gathering as much footage as possible, interviews that I knew would not be in the YouTube vids (like with his daughter Sue). The thought for me was always Mark 9:1 to May 21. 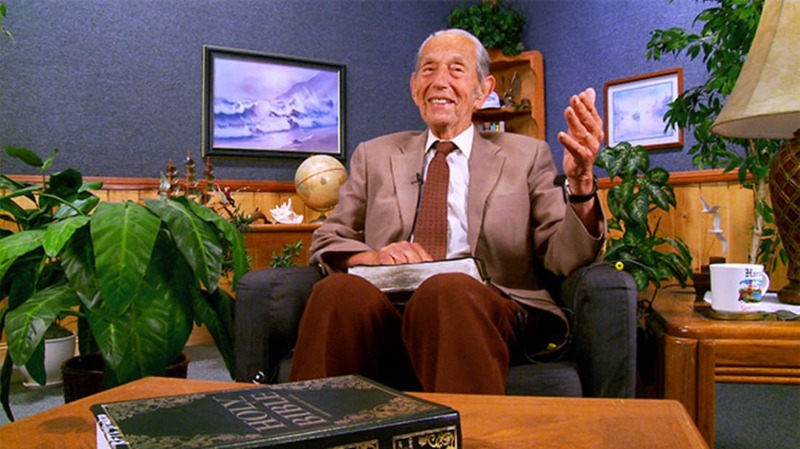 Harold Camping interviewed at his home in May 2012. Photo by Zeke Piestrup. Higgins: What has the aftermath been like? Piestrup: People despise Harold. And to me, the anger felt towards Harold does not justify the crime. 40% of Americans think Jesus is coming back before 2050. Did Harold do that? We U.S. Americans don't like to examine fully the apocalyptic fervor in this country. 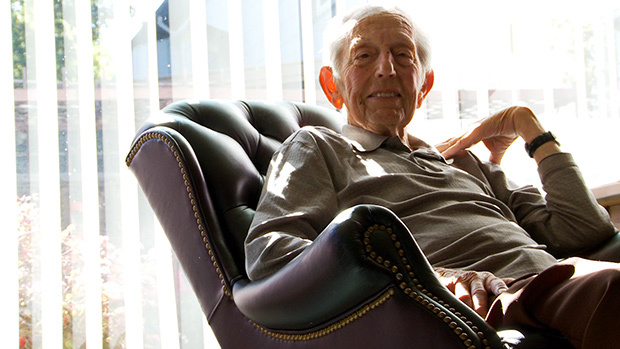 When someone like Harold pops up, we'll write it off as another example of the Millerites. The Millerites are a sign post, they're like Pearsonville (on the way to Mammoth), the hub cap capital of the world. A distraction. We're going to Mammoth here. We will repeat the events of May 21, 2011. Folks don't want to come to terms with the fact that this goes back to the origins of Christianity. That Jesus, as portrayed in Mark's Gospel, makes many predictions about the end coming in the lifetime of his followers (Mark 9:1, Mark 13:30). That Paul, the greatest Apostle, thought the end was so near that folks should not bother getting married (1 Cor 7: 8-9; 32-34). That John the Baptist, who baptized Jesus, was proclaiming an apocalyptic message. Jesus' ministry was fully apocalyptic. Those who preceded him (John the Baptist) and came after him (Paul) believed the end was upon them. It would be rather improbable if the middle (Jesus) thought differently. Yo John, I'm not down with your message, but baptize me anyway?? The excitement that Harold tapped into is the same excitement that birthed a new world religion. That's how far back this goes. And you wanna hate on Harold? His crime is the same as the supposed crime-less. 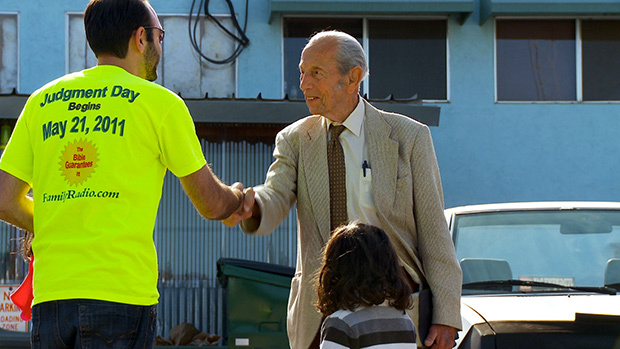 A Family Radio listener meets Harold Camping. Photo by Zeke Piestrup. Lastly, when I say I'm down with Jesus, I also believe that Jesus is down with me. Whatever life we lead, would you not want people to remember you for what you actually taught and believed? That's what the intellectual ballers of SBL (Society of Biblical Literature) are doing. And that's what I try to do with my work. It has been noted that Christianity was not the religion of Jesus, it's a religion about Jesus. Like Hollywood's "based on a true story." Well, when He started walkin' on water, we should have detected that perhaps we've jumped the shark. And who was Jesus? See Albert Schweitzer then and Dale Allison today. We certainly know a lot more. And the most probable answer (since history is really about probabilities): He was a Jewish apocalypticist proclaiming the imminent arrival of the physical Kingdom of God here on earth. When? Within the lifetime of His listeners. Amen.